Brigg & District Breast Cancer Support Group is proud to be involved with raising money for the Yorkshire Scan Appeal to obtain a revolutionary new cancer treatment facility for the Regional Cancer Centre in Hull. A cheque for £2,500 was recently presented by the Group to the Appeal. Pictured, left to right: Jean Van Der Ende, Chairperson Yorkshire Scan Appeal; Tracey Riggall, Chair BDBCSG; Dorothy Fagge, Project Co-ordindator Yorkshire Scan Appeal. 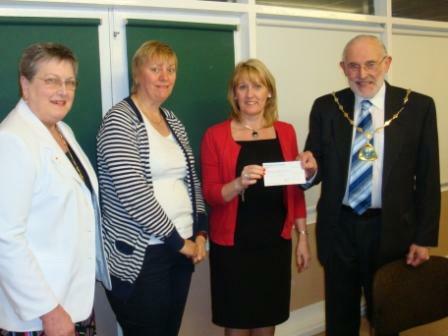 Our Chair, Tracey Riggall, and committee member Cherie Hardwick are pictured with the Mayor and Mayoress of Broughton who presented the group with a cheque for £140. We were their chosen charity for the year, along with LIVES. Receiving a cheque for £200 from Radley & Appleby Holidays. Monies raised from a raffle and sponsorship at their 25th Anniversary party in April 2016.